Definition at line 1258 of file PatternMatch.h. Definition at line 1264 of file PatternMatch.h. Definition at line 1266 of file PatternMatch.h. 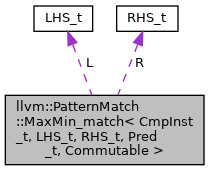 References llvm::dyn_cast(), llvm::PatternMatch::match(), llvm::PatternMatch::brc_match< Cond_t >::match(), and SI. Definition at line 1259 of file PatternMatch.h. Definition at line 1260 of file PatternMatch.h.